A peak is the pointed top of a mountain, the mountain itself or, broadly, the pointed top of anything. Figuratively, the highest or most important level or point of anything is also a peak. On a cap, the peak is the front edge that sticks out and covers the eyes. In US English, peak is also the name for a higher fare or charge you pay during a time period. 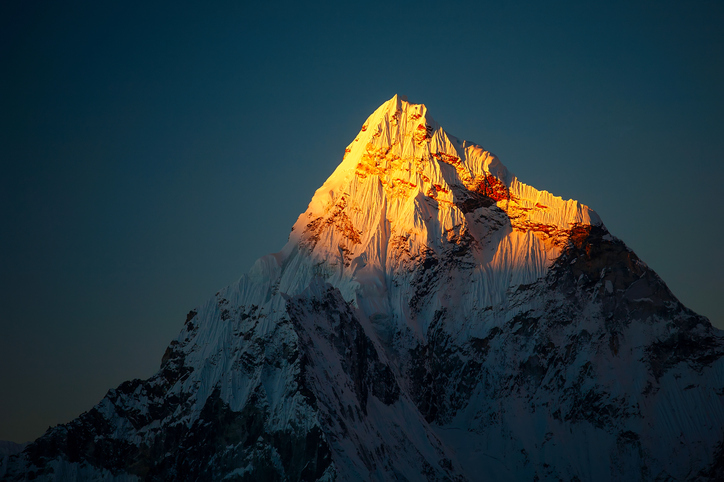 As a verb, to peak means ‘to stick out’ and also ‘to reach the highest level of activity or development.’ As an adjective, peak describes anything reaching the highest level or point, either literally or figuratively, or a higher fare or charge. The climbers reached the peak. The roof formed a peak above the house. The businesswoman is at the peak of her career. Joe tugged the peak of his cap down a little. Sheila didn't want to pay peak, so she decided to get a later flight. The band's popularity peaked in the 1980s. Summer is the peak season for tourism. Peak fares can be very expensive. widow’s peak: a point formed in the hairline in the middle of the forehead. Another meaning of peak as a verb is to become sick or weak. This meaning is no longer used, but the related adjective peaky, meaning ‘sickly or weak,’ and the noun peakiness, which is the state of being sickly or weak, are still in common usage. Peak, meaning ‘pointed top,’ dates back to the early 16th century. The noun originated as a variant of pike (sharp point), which was pik or pyk in Middle English, and piic in Old English. Its origin is uncertain, but many linguists agree that it is from a Germanic source (and related, in this case, to the Middle Low German pēk (pick or pike)). Others believe it may have come from a Celtic source, and then been adopted by Germanic languages. They cite a possible relation to the Gaelic pic (pickaxe) and the Irish pice (pike or pitchfork). In addition to pike, peak is related to the English word pick. In fact, the three words were used interchangeably until the late 15th century. Peak was first used to mean mountaintop in the early 17th century, though pike had been used for this meaning until around the year 1400. It has been used figuratively since the late 18th century. Widow’s peak has been used to describe a pointed hairline since the early 19th century. The verb comes from the noun and, meaning ‘to rise in a peak,’ dates back to the mid- to late-16th century. The figurative sense ‘to reach the highest point’ was first used in the 1950s. Peak has been used as an adjective since the 18th century, but it only became common in the 20th century.